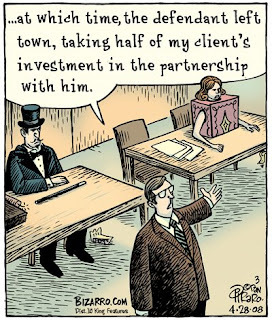 This Bizarro cartoon made possible by Better Half Wedding Planners. My cartoons are drawn and submitted four to six weeks before they appear in the paper, so I often see something different in them after they're published than I did when I drew them. This is one of those cases. As I look at it now, I wonder if I shouldn't have had the lawyer pointing an accusatory finger at the magician, instead of motioning to his client. I wonder if some readers were not confused by this joke. Readers were confused by a different courtroom scene, the Life Coach cartoon, but this one didn't seem to be befuddling. Frankly, I'm confused by all of your jokes, but I pretend I'm not. I realize I'm only fooling myself. I'll bet there are lots of people confused by "Bizarro" but don't want to admit it. i wasn't so much confused by where he was motioning, rather, where the dialogue bubble was coming from... it seems like it's coming from an invisible person sitting next to the half woman. that may also just be me. also- love the "pointing" and "confused" links. they made me happy. I was initially confused - I thought "where is *her* lawyer?". Because I assumed that the dialogue was about the victim, and that the joke was that although the woman was the clear victim in which her body had been physically violated, and full personhood (literally) denied her, that the legal system had the audacity to try *her* for denying the (presumably male) magician his 'property'. Which in my opinion is a much sharper joke than the one I eventually realized the artist was actually making. I may have an entirely different take on this courtroom drama. I believe the magician and his attractive (half) assistant are working together to fool the justice system (although I'm still working out the details why). However, for anyone who knows a little bit about magic, realizes that the female assistant has not actually been cut in half. It is an illusion whereby her legs are neatly hidden by extending them inside the tabletop. Geez, now that I think about it, that would be impossible! Maybe the bottom half did skip town. Very likely what you would expect of a body part without a brain!